Ducting - Page 1 - BISCO Enterprise, Inc.
Nordfab Ducting is known as the world's fastest ducting because it has quick and simple clamp type connections where no rivets, screws or welding is needed. It's constructed with laser welded seams, making it strong and leak tight. It's also adaptable and easy to install because it decreases install time by 45% and can be connected to existing ductwork or wherever dust collection is needed. 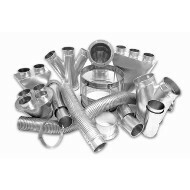 We also offer a lower quality, more standardized type of ducting, Spiral Pipe and Spiral Fittings. Click on a category to view individual products and their benefits or scroll down to shop products.